Oh really? Could you please explain what exactly you did to get it working in Nestopia? THANK YOU VERY MUCH!!!! The patch is already out! Playing it right now and it's awesome!!! 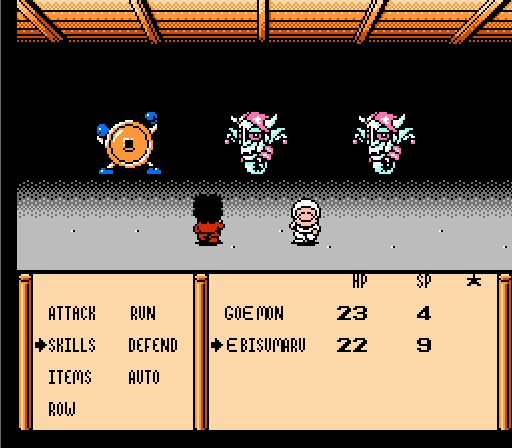 I cant thank enough for your work on this game, i've been a Goemon fan since the snes days and to have another entry in englishh is like a dream!! 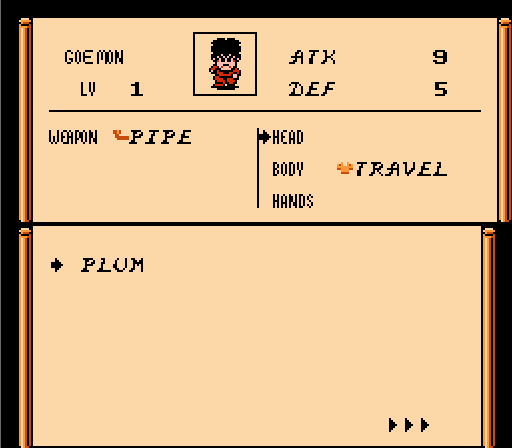 The game is a really really neat rpg, good ol' Konami doesn't dissapoint there! but the only grip i have is like some of the rpg's of that era, you cant see what armor can equip your party members so you end buying one of the newer ones and keep trying equipping it until one of your pcs can equip it. This is time consuming and it would be much more efficient if every one had a distintive armor/globe icon, but hey i cant complain!! There's a helper NPC that you can recruit in one of the early towns (they're a bit hard to miss), who will appear in shops to show you who can equip which items. Unfortunately the NES emulator within the Retron 5 seems to be to new. Game doesnt work with the patch. And i was soo excited already. If there's no way to roll the emulator back to a previous version or for you to use a different emulator, sorry but you won't be able to play this on the Retron 5. I've heard that you can factory reset the Retron 5 and then upgrade to an old firmware version on an SD card, maybe that will help? I've never used one though, so can't confirm anything. Well, that's a lot more complicated and the methods used can vary on a game to game basis. For most of them, you're probably going to need an experienced programmer to help at that point. Sounds like you did it right, but something might have been overlooked. Did you open your Test.nes file to check that your modification worked as intended before you made the patch file? 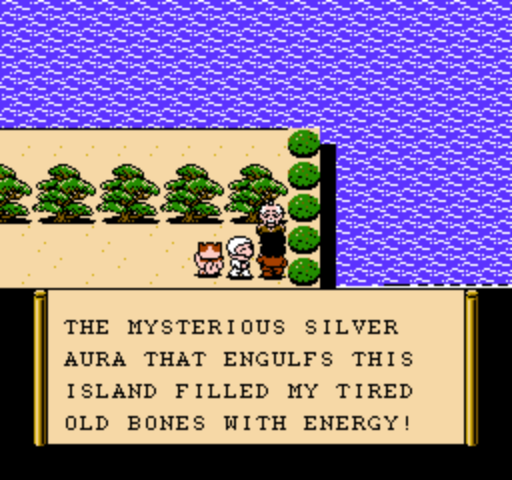 That game has 2 different sets of tiles for text, which are both used depending on which map is currently loaded. Did you overwrite both of them? Edit: Sure, I don't see why not. You'd open the patched ROM in your tile editor, make your changes, save it with a different file name, then open Lunar IPS and select "Create Patch". Select the patched ROM as the "Original unmodified file" and your edited, renamed copy as the modified file to use. Note: This method would make your patch only work as an add-on to my translation. That's right. The font isn't compressed, so you could easily change it to whatever you prefer with a tile editor like YY-CHR or Tile Layer Pro. Congrats to your sibling on the impending birth of their child, and to you on completion of your translation patch. 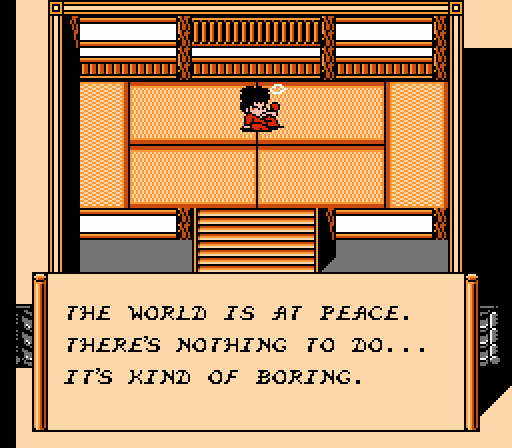 Remember when I said I wouldn't translate Ganbare Goemon Gaiden 2? ...I lied. Sorry, I didn't mean to mislead anyone. 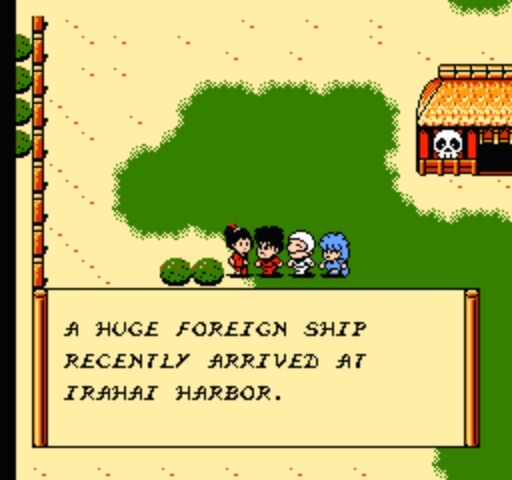 I really wasn't interested at the time, because I'd just spent months translating the first Goemon Gaiden and didn't feel like jumping straight into another project. But then, one day I decided to look into GGG2 out of curiosity (just to see how far I could get with it), and somehow ended up translating the whole thing. Yeah, the translation is already complete (no messed-up credits to worry about this time). My current intention is for the release of the patch to coincide with the birth of my niece, who is due near the end of August but could well end up being born prematurely. We'd like to play through the game one last time and possibly make some final adjustments to the script before then, but that's it. 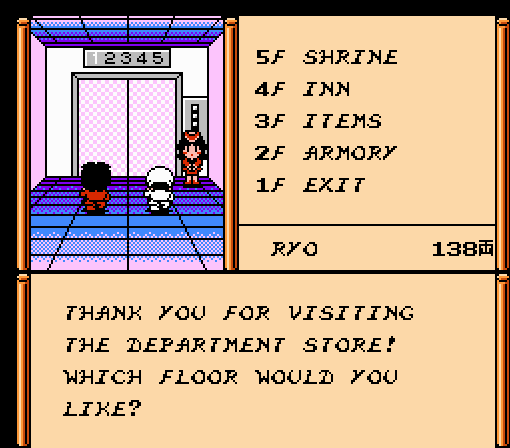 There are a couple of references to the first Ganbare Goemon Gaiden in this game. I've tried to keep things like weapon names consistent between the games, too. I think I used a better font this time. I don't have much else to say, really. I hope you look forward to playing it. Here are some screenshots. They were taken in a few different emulators, so if some look more blurry or have slightly different colours, that's why. 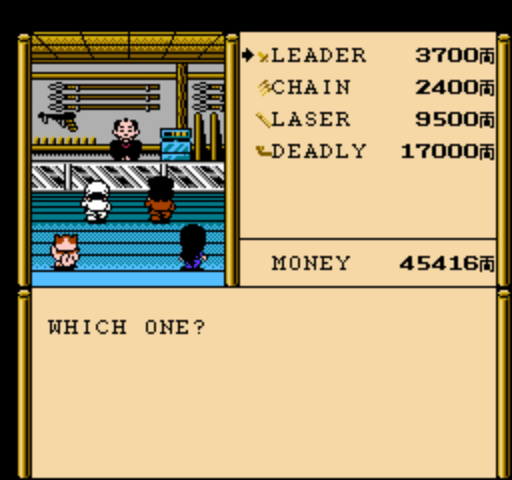 News Submissions / Re: Translations: Ganbare Goemon Gaiden: Kieta Ougon Kiseru patch is out! I don't mind if anyone links to my list of bugs, but just so you know, the webspace it's uploaded to is just a throwaway free account that I use when I need to host something. I don't know how long the page will be hosted for in the future. It's probably best to copy it somewhere else if you're really interested in this game and think the list is worth preserving. I don't intend to include any fixes that anyone might make for those bugs as features of this translation, as I feel that a translation should just be text edits only... with the obvious exception of fixing this game's credits. I think that being able to see the credits is important, even if they're just in Japanese. The people that worked on this game deserve to have their names shown for their effort. 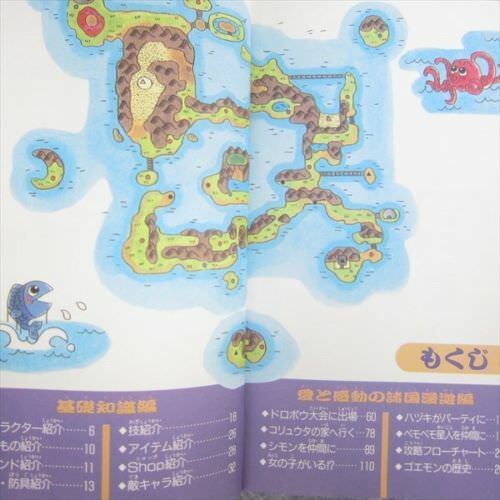 As for translation, someone else already did that (http://www.vgmuseum.com/end/nes/b/goemongai1.htm). Note that the way their mock-ups look probably wouldn't be reproducible in the game, you'd have to make the text much smaller to get everything to fit properly. By the way, you said in the GG Gaiden development thread that you weren't interested in translating Gaiden 2 because you don't like it at all. Is it really that bad? I don't think that GGG2 is a bad game, it just doesn't appeal to me personally. I don't like the music compared to the first Gaiden's, or the switch to the Phantasy Star II-style battle perspective. For me to be motivated to spend the countless hours necessary to fully translate a game, it has to be something that I would be excited to play through in English myself. Otherwise, I quickly lose interest. 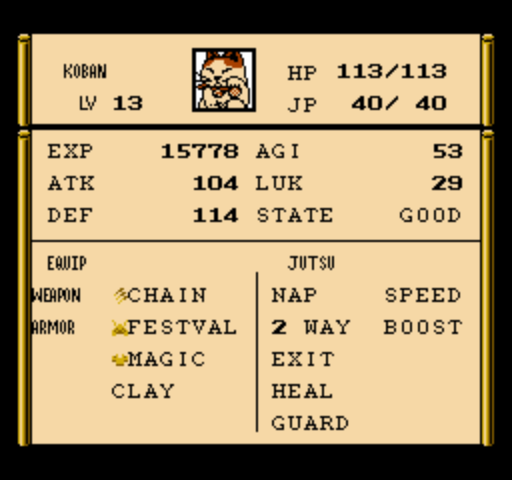 Besides, others have shown an interest in translating Gaiden 2, and I'd like to give them the opportunity to do so. No. I don't like GGG2, so there's no way I'd want to spend the necessary amount of time with it. This project is now ready for testing. Please reply here if you're interested. 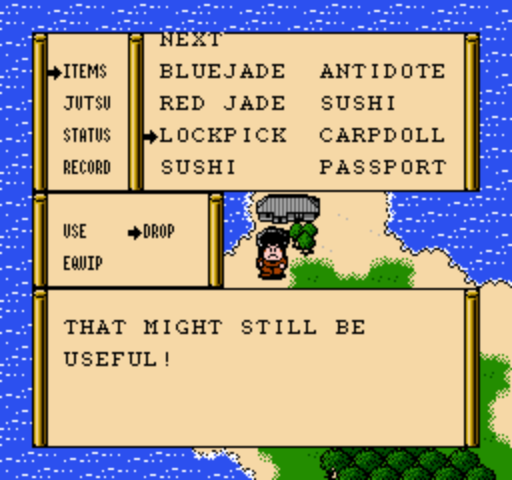 My Ganbare Goemon Gaiden translation patch is just about ready for distribution, but first I'd like some people to play through it and inform me of any glitches, typos, or untranslated text that I might have missed. This is so that the final release can be of the highest quality possible. If you're the type of player that likes to fully explore a game, trying out every item, revisiting old areas to see if anything has changed, seeing if the text changes depending on which party members are alive and so on, then this request is for you! Please reply in this thread, or send me a PM or e-mail to apply. Yeah, and I wouldn't know how to get around that effectively. I like it, but mine's a bit different. I can't add that extra square at the start for the G, because that area is a bunch of the same single white tile reused, and there aren't enough spare tiles to overwrite to get the G in there, if that makes sense. However, I am able to fit in "The Missing Golden Pipe" in your style. 5 years after I first started looking at how the text works in this game (and not getting very far), I decided to return to it this April... and now, after about 2 months, I have an almost complete translation that should be ready for testing in June. Since item names have an 8-character limit, I decided to draw in icons (influenced by Final Fantasy Adventure) so I wasn't trying to cram, for example, "Laser Flute" into that space. I think the icons are also helpful in figuring out which characters can equip certain weapons, so I'm quite fond of them. 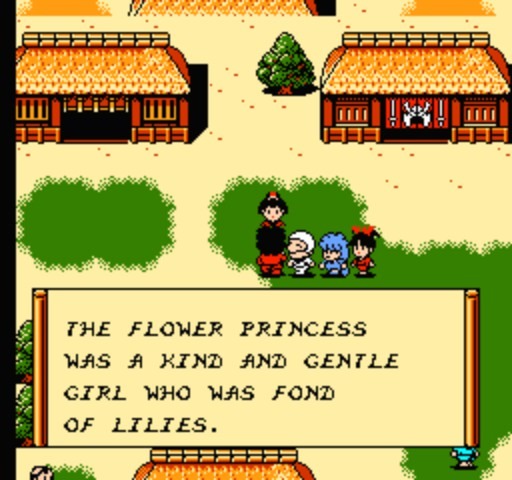 Everything has to be in caps because of the way the game uses a dictionary to compress the text. There isn't enough room to have variations that use capital letters at the start of words for new sentences, or even enough spare graphical tiles to include a lower-case alphabet. News Submissions / Re: Translations: Nangoku Shounen Papuwa-Kun: Ganmadan no Yabou (GB) English Patch Released! Yeah, his name was added to the readme file in the zip, but I'll submit it to the credits on the project page too. Thanks, rainponcho! I've used the tools you provided to edit the company names and title screen, and submitted v1.00.